GENERAL INFORMATION: This level is the domain of the dead and dying - hardly a place fit for normal beings. The temperature here is abnormally cold (about 50 degrees) and the air is dry, reeking like the oldest tomb. All stone here is dark grey granite. The western portion of the level is comprised of spacious, angular tunnels and rooms; these have 10' ceilings unless otherwise noted. The eastern area is made up of roughly-hewn tunnels and caverns; the tunnels are typically no more than 10' wide or high. Many areas of the catacombs feature skulls and bones imbedded in the stone. This entire area is not directly connected to the upper floors of the fortress - the only way to get here is via teleportation, and only Xusia has both the magic and the knowledge of this hidden destination. f2. Catacombs entrance This is the first area of the catacombs. A large, black cauldron rests over a shallow fire-pit; within the pot are boiling body parts. Three witches reside here: witches (3), ac 7, P5 of Orcus, hp 25 each. Any noise here will attract the occupants of area f5. f3. Storage This room is basically a morgue, containing 7 fresh human corpses. They are already reeking pretty badly, and the smell will be noticeable from quite a distance away. f4. Mine This large chamber also contains an unfinished mineshaft to the east. Work here was halted when a section of granite was reached. A half-completed flesh golem lies, immobile and rotting, at the mouth of this shaft. 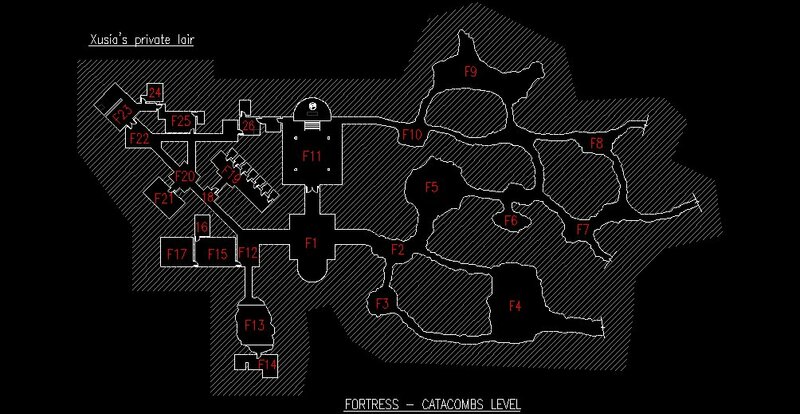 There are also 74 undead rats (hp 5 each) roaming this cavern. f5. Wights This large cavern has a 30' ceiling and several crude huts around its edge. It is home to a sizable community of wights (17) which are minions of Xusia's witches. There is collective monetary treasure here worth 1748 gp, plus a wand of frost which the wights' leader has no idea how to use. f6. Storage This area holds food and drink as well as supplies for the witches' various spells. f7. Abandoned shafts This area is empty. Several large picks and shovels are strewn about. f8. Haunted mineshaft This dead-end tunnel is the lair of a spectre (62 hp.) Whatever his desires and goals are, he's not finding them here in the fortress, but he's not yet figured out how to leave without invoking the wrath of Xusia. As a result, he remains here, agitated and aggressive. There is a bronze horn of valhalla hidden in the rubble at the end of the passage; any warriors summoned by it will be zombies rather than berserkers. f9. Main witches' lair Seven more witches reside here (ac 7; P11, 10, 9, 9, 8, 7, 6 of Orcus; hp 55, 50, 45, 45, 40, 35, 30.) There are not one but two cauldrons, as well as a number of dirty straw beds scattered around the floor of this cavern. These witches serve a number of purposes, mostly menial tasks that Xusia hasn't the time or inclination for. From time to time he will send one of them out into the world for some foul purpose. f10. Temple side entrance This area contains a huge statue of a mummy. For one who knows the command word, however, the statue can be used to communiate with the mummy king Al-arakara, in the Sea of Dust half a world away. f11. Temple of Orcus This huge hall is Xusia's tribute to his dark master. The majority of the chamber has a 20' ceiling, with a raised domed area to the north, above a gigantic statue. The four columns are each 10' wide and carved so that they depict wailing, lost souls. The dais to the north is fully 10' above floor level, with a domed ceiling of 30' height. The statue of Orcus is 25' high and casts an evil leer around the hall. This statue can become animated to allow Xusia to speak directly with Orcus. No undead can be turned within this hall, and in fact they gain a +3 to all attack and defense rolls due to the power of the evil god. The statue's eyes are actually gigantic rubies, each worth 50,000 gp. f12. Guardroom Five ghasts (hp 14 each) stand guard here. They are easily the weakest undead on this level, and they know it, so they try their best to stay out of everyone's way. They don't know it yet, but feeding them is becoming an annoyance, and Xusia will soon destroy them or let them starve. f13. Dark chasm This pit is nearly 100' across and twice that deep. In addition, the entire cavern (including both near and far edges of the pit) is cloaked in darkness that cannot be dispelled. The bottom of the pit is filled with sharp, dirty stalagmites and any who fall will suffer accordingly. The cavern's ceiling, above floor level, is 20' high and dotted with sharp stalactites. The door at the end has explosive runes and wizard lock, both cast at the 12th level of ability. f14. Drusilla's chambers This suite is home to Drusilla, a wizard and vampiress who serves Xusia and Orcus. Drusilla appears as an attractive but not stunning human woman in her late 30s (unlike some, she didn't become a vampire in her youth.) She favors black and red and dresses conservatively. This vampiress always strikes with magic first. She favors spells that charm, stun, or trap foes; once this is achieved, she will feed. She also possesses a wand of frost, a ring of spell turning, and a dagger +2 that can cast darkness, 10' radius upon itself at will. Drusilla's living quarters betray her aristocratic upbringing; everything here is of high quality and neatly arranged. A small golden chest holds 13,000 gp worth of gemstones and jewelry. Drusilla uses a coffin instead of a bed; this coffin locks from the inside and has a tiny hole in the bottom which opens into an inch-wide shaft drilled in the floor. This escape route, made slowly and painstakingly with magic and trial-and-error, winds down 40' before opening into a natural underground cavern whose fissures eventually intersect the Underdark. f15-17. Empty storerooms These three rooms are, oddly enough, empty. f18. Cellblock entry This locked door is guarded by a zombie troll (stats and regeneration like a troll's, 45 hp, has immunities of a zombie.) This thing is one of Xusia's failed experiments - it wasn't smart enough to obey complex orders, and thus was deemed unsuitable for mass-production as an army. f19. Cells All seven of these are empty, as feeding-time just came for those inhabitants of this level who require flesh for sustenance. f20. Guardroom This area is empty, save for a large pile of black slime in the eastern corner. f21. Corpse storage Within this large chamber, preserved by Xusia's magic, are seventy stout corpses waiting their turn to be transformed into undead to serve the lich. Needless to say, the smell here is overpowering. f22. Antechamber The southwest corner of this area has a 3' diameter mark on the floor, as if something rested in that spot for a long time and was recently moved. The double doors to the northwest are fashioned of interlaced bones. These doors bear a symbol of the ages; any living being who touches them with bare flesh must save vs death at -5 or decay into dust. The doors are also wizard locked at the 24th level of ability. If they are opened, Xusia will instantly be aware of it. f23. Workroom The southeastern portion of this chamber contains a gigantic, ancient wooden desk. Spread across it are various books, scrolls, maps, and writing instruments. One of these books is a history of the fallen sueloise empire - one of Xusia's favorites. A crystal ball of maximum power rests on a pedestal to one side. The northwestern portion of the room holds various magical items of use to Xusia. Among the items stored on shelves here are a staff of the magi, a wand of conjuration, a wand of petrification, an unholy ring (wearer cannot be turned), twin/keyed coffins of teleportation, a +3 frost brand longsword, a talisman of pure evil, a candle of invocation, a book of foul deeds, 17 scrolls (each containin 2-7 spells of level 2-9), a mace +4, a portable hole, a medallion of ESP, a broom of flying, and a helm of darkness. At the far end of this part of the room is a portal of teleportation, a device which allows instant travel to like portals. The one here is the original, meaning that while others like it can only allow travel to one other such portal, this master gateway can go to any of the others. Xusia has begun implementing these devices in key areas across the world; he and others of the Nine are very close to perfecting larger portals, of the sort that would allow entire armies to move instantly from one place to another without a spell or a spellcaster. f24. Bedchamber Little-used and empty, this room smells like a tomb. f25. Library This chamber houses one of the oldest collections of books in the world. Xusia has had almost two thousand years to study and gather knowledge, and the hundreds of tomes and scrolls here represent the choice bits. None of the items in here can be taken out (save by the lich himself) and all are magically preserved. It is not necessary to go into detail about the contents of this library; suffice it to say that any sage would give an arm (and some probably have) to spend an hour in here. f26. Skorvus' chambers These two rooms are the dwelling-place of the lich Skorvus. In life, the priest Skorvus was utterly devoted to his dark demon-god. In death, the lich Skorvus is still as devoted, but much more dangerous. His status with Orcus allows him to know and use evil spells of utmost power. Skorvus does not use weapons or engage in combat; he doesn't have to. Any living being who comes within 10' of him will encounter a field of decay (-3 STR, CON, DEX plus blindness plus deafness plus stunning, each effect must be saved against separately, save vs death magic at -2.) This lich favors spells of death, decay, and negative-plane energy and will always use such magic from a distance. With a single spell, he can raise entire legions of the dead, or inflict a terrible plague upon a kingdom, or spoil a season's worth of crops. These chambers are little-used, as liches do not require sleep. A gigantic desk occupies most of the larger room, the remainder being filled by shelves. Both table and shelves are covered/filled with books and scrolls, as Skorvus takes his research very seriously. One of the volumes is a Book of vile darkness which the lich is about two-thirds done with. Another volume contains the necessary spells and knowledge to allow travel to any of the lower planes.